For years on end, in my twenties, my life was lived a’ horseback as a nomadic hunter-gatherer in the forests, mountains and valleys of New Mexico and Colorado. The late Spring, Summer and early Fall months were spent in the saddle and around the campfire. My primary source of sustenance came from the wild game I would hunt, the roots, berries, herbs and mushrooms I would gather. It was a challenging life, as my survival was fully correspondent with the choices and actions on a moment to moment basis. Sometimes they were good choices. Sometimes not so good. My reckless nature, as a young man, was soon brought into line. Mindless behavior could easily bring the consequence of a painful and lonely injury or even death. This experience brought me to a place of self-reliance, free of any excuses. Nature has no room for excuses. Mistakes were all mine to make and learn from. I spent a lot of time, therefore, in mindful consideration of my environs. A naturalist’s study of the weather cycles, seasonal changes, the rising and setting patterns of the Sun, Moon and stars through the seasons and years led me into a deep understanding of the interconnectedness of all life about me. I came to know that I was an integral aspect of that tapestry of life, not apart, not merely an observer, but an active participant, subject to the whims of nature at all times. I earned from this a sense of place in the bigger picture, and the grace of humility. Many days on end were tasked with getting up, checking the horses, preparing food for breakfast and a lunch to pack in my saddlebags, saddling and packing the horses. All this just to be able to set forth on another day of riding. In the evening I must then find a meadow, with a spring or stream, in which I would make my camp for the night. All my efforts were based upon the necessities of the horses’ needs of graze, water and safety. Even my campfires at night were integral to the protection of the horses, as mountain lions and grizzly bears, who might seek to prey upon the foals, would tend to stay beyond the perimeter of a fire’s light. My survival depended upon the well being of my horses. Respect for the needs of these companions, and of their limits, was crucial. So did I come to learn to acknowledge and respect my own limits, and, when I would encounter them on occasion, those of my fellow human beings. I had plenty of time. At least two days of the week, sometimes longer, I would make a camp and stay put, allowing the horses to fatten and rest. This would also afford me the opportunity of repairing my gear, go hunting and to just enjoy the beauty of where I was residing. Many an afternoon was spent kicked back in the shade of an aspen tree, reading a book or contemplating the natural world around me. There were times when I would spend hours on my belly, watching ants go about their business. I might then flip over on my back and study the clouds, observing what made them move and change form, build or dissipate. My keen sense of observation, of noticing everything in my field of awareness, was developed and honed during those times. Even today, still, very little slips past me –much to the chagrin of my then-teenagers and much to the amazement of those who come to me for mentoring. It was during the time of an extended camp that I found myself in a deep contemplation. Just as a playful mental device, I began to imagine that the lengthening shadow of an aspen tree, as the sun was setting towards the west, was the ‘thing’ and that the tree was its projection here in the 3D world. Like I said, I had a lot of time on my hands. A bit later I rounded up my horses from their wanderings in the large meadow we were in, and brought them all closer in to camp in preparation for night time. I had jumped a’top one of the horses and was riding her to camp when I noticed the exaggerated shadow of myself on top of the horse. 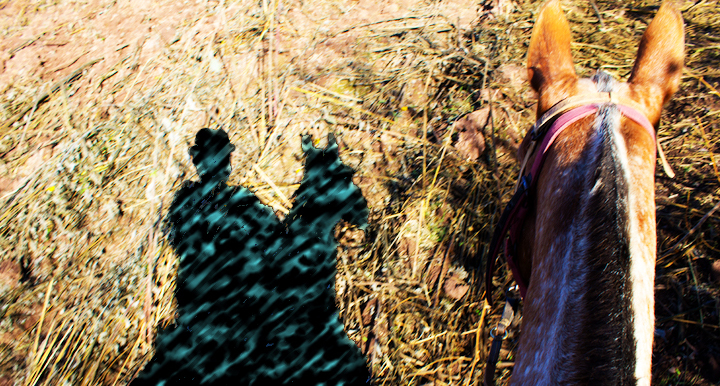 I flipped my perspective back to that of seeing the shadow as the reality and me upon the horse as the projection. For one brief moment my awareness was experienced within and as the shadow! How strange, I thought. And yet, that night, as I sat around the campfire, I was intrigued by that momentary experience and began perceiving the dancing shadows around the fire as if they were a world separate and distinct from the world of form. It was then that I decided to task myself. I would, beginning with the rising sun the next morning, set aside three days and nights wherein my attention would reside in the flipped perspective. Shadow, the reality. Form the projection. Arising with the pre-dawn light, as was usual for me, I made coffee and roasted the last of my venison upon the coals. A handful of service berries stirred into a bowl of freshly made oatmeal completed my breakfast. As the sun rose I made my way into the meadow to check on the horses and bring them to water. My own shadow stretched out ahead of me as I crossed the meadow. Keeping my focus upon the shadow-as-reality was not going to be easy, I could tell, but nonetheless, that being my commitment, I imagined my shadow self gliding across the ground. Only, it was not smooth. My shadow self was, at the same time, encountering the shadows of each blade of grass, every shadow of dirt mounds thrust up by moles, and the shadows of birds flying overhead. Whew! This was going to be work! As the day progressed I retreated into the shade of the aspen grove at whose edge I was camped. Now, when one lives, as I was, as a part of the landscape, whenever I might enter the forest I was a part of the forest. If I were in a meadow, I was an integral part of the meadow. This was my familiar way of being. So the shift into being integrated into the shade of the forest was a minor step. My awareness was subsumed into the deep, cool, depths of the forest’s darkness. All sense of separation from my surroundings was vanquished. As the leaves of the quaking aspens fluttered in the breeze, sunlight would pierce through the darkness, illuminating bits of my body and, therefore, casting segments of my body’s shadow upon the ground or the tree upon which I was leaning. In those moments the illuminated body parts – it might be my hand, or a knee – became aware as such in and as the shadow cast. These glimpses of individuated awareness as specific body parts, then (from this altered attention) projected into the world of form as those body parts brought with it an acutely heightened awareness of the hand, or foot, or whatever, in worldy form. Existent cuts, pain or tiredness was communicated as if they were the whole of my experience. This was getting interesting! By the end of that first day I was exhausted. Still, a fire built for the cooking of my evening meal, and as a source of warmth as well as comfort, cast shadows of the cast iron fry pan and the tea kettle. As the fire burned down to coals and then ash, my shadow was once again merged into the darkness of the forest and the night about me. I laid down in my bedroll. My senses, at one with the night, dissolved from any form-given reference. As I drifted into sleep I was able to comport the silence of the birds and critters of the forest with my own nascent silence. I slept, having become the Shadow of Night. Dawn broke with a palette of reds and oranges in the eastern sky, indicating a cloudy day, possibly with rain. Shadows were suffused, dispersed, even indistinct at times as the morning progressed. Maintaining the commitment to my task, I experienced the feeling of being a wraith floating through the world. My awareness was indistinct, monotone. Likewise, did I notice, the animals of the forest, meadow and air were subdued. I had come to perceive, from this unique perspective, how the activities of the critters expressed the ambience of light and shadow in their environs. As the day wore on it rained for a brief spell in the late afternoon, followed, as is typical of Rocky Mountain weather, by clear skies and renewed vitality. Shadows returned, as well, and with them, in my altered perspective, a return to individuation. In my Shadow I was alive. I had made ‘the shift’! Just prior to sunset I went to round up my horses and bring them, again, closer in to camp and safety. As I approached one of my horses my shadow fell upon him. He looked up with a startled expression. My presence, as Shadow, had been felt by him! He turned and walked right up to me, staying in the path of my extended shadow. I chuckled as I stroked behind his ears and under his chin. That evening, as I stoked the fire to brighten the meadow and the forest behind me, to make aware the bears or cats of my presence, I had another sudden realization. It was not the light of the fire that kept the predators at bay, but the casting of my shadow, far across the meadow and deep into the forest, by the light of the campfire. As my horse had felt my Shadow, so did the animals of the forest! Okay, at this point you may be thinking that I have gone over the proverbial edge, as these events I am describing, and the realizations they have borne, are not reflective of reality. Relax. It is an exercise in shifting one’s perceptions. Day three. I woke from sleep still dreaming. The Shadow, my Dream Self, had broke free of its egg shell and had emerged into conscious embodied expression. Every activity, each event of the day, each and every thought and feeling was revealed to me as the projection of the Dream Self into the 3D world of manifest form. Choices, which I had hitherto thought to be the result of my considered processes of selection and action, were all predicated upon the churnings and stirrings of my Soul, my Dream Self. I had thought, until now, that my decision to get up from the shade of the tree and go check on my horses, and pick some nettles for a stew, was the result of my deliberations upon the amount of time since I had last checked on them, the heat of the day and the building of storm clouds over the mountain. With the awareness of my Soul expressed in Consciousness, I knew that my Soul, in its intimate relationship with the Souls of each horse, could feel their need for connection, their thirst (and need to feel safe in going into the darkness of the forest from which the spring bubbled forth from the earth) and concern of possible lightning with the coming storm. This I felt, and responded to, in the very core of my Being. The Tapestry of Souls, woven of the threads of Awareness, were the source and origin of my worldly endeavors. As I went out, following the short but intense thunderstorm, to hunt, my choice to go this way rather than that was guided by the response of the Ots’o, the Mother of all Game Animals, to my commune with the Earth Mother and the grouse (a small chicken-like wild fowl), respecting my legitimate need to feed myself. She implemented within me the urge to move through the forest in such a manner as to bring me to the precise location of a flock of grouse in a tree. Receiving two grouse, of the six in the tree, was sufficient for my meal. Offerings of appreciation, received and accepted by Ots’o on behalf of the grouse and the Eternal Circle of Life, assured that the balance of Life was maintained. In the living, walking, waking Dream that was my life, the sentience of the World, expressed as the forest, the grouse, myself, the horses, Ots’o, the meadow, the storm, the mountains – everything– all were threads of one Tapestry of Life. There was no ‘taking’ the life of the grouse, nor of the herbs which I gathered. There was only the weaving of the threads into a new texture and pattern of Life. Night fell, and all was Shadow. Except the stars above me. Ah! The stars! Their scintillating twinkle cast subtle shadows within the shade of night spread across the meadow. My Dream Soul, my Shadow, experienced the Loom of the Heavens as each star activated the threads of my life’s tapestry, as if strumming the strings of a harp’s chords. My Soul resonated, sang, with the activations. And in the song of my Soul, so was my life’s pattern rewoven as the epiphanies and symphonies of Awareness woven intimately with all Life. Three days of living life from the perspective of the Shadow. Once awoken into conscious embodied expression, my Dream Soul has integrated into my perceptions of this world. This world, my world, your world, is the expression of the Dream Soul weaving the Tapestry with the vibrant threads emanating from the Shadow. The insight born of my time in the Shadow, and of the Shadow expressed in me, irrevocably altered my perceptions of the world. 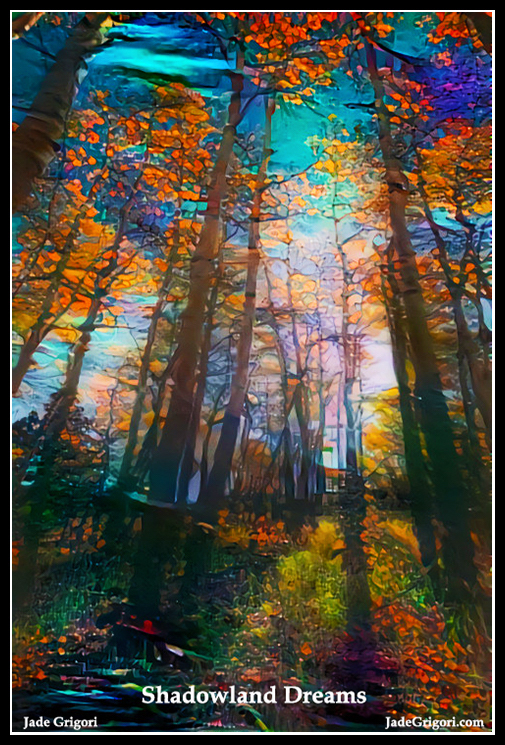 With these insights intact, the ability to perceive the weaving of the threads of an individual’s Tapestry of Life, and of their actions and behaviors not as some consequence of their psychological profile, but as a profound statement of the Truth of their Soul expressed into and as their world. We are but the weaving of our Shadow, the Dream of our Soul.